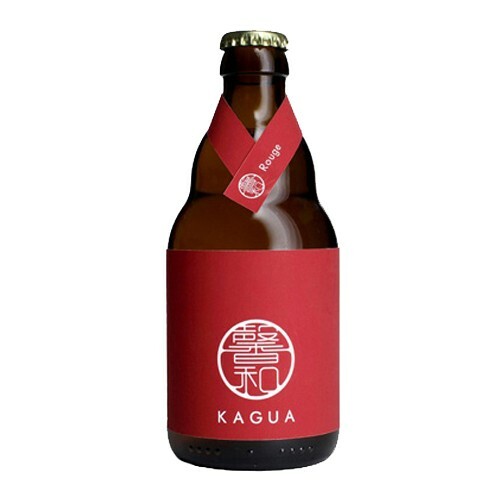 Kagua Rouge is unlike any beer you've tried before. It's a little like a Flemish red, a little like a Belgian wit and a whole lot of Japanese and Belgian craftsmanship with its yuzu and coriander flavors. It pours with a beautiful ruby body and a head that lasts and lasts. The nose is fruity and malty. The body is full and malty, yet still elegant, and has slightly peppery bite from the Japanese spice of sansho. Kagua beers are designed to be paired with the finest foods, so make your favorite dish, pour some Kagua into your favorite wine glass and enjoy the night.